The record-breaking and extremely popular exhibition, MathAlive!, is now being produced exclusively for touring in countries across the Middle East region. This exhibition will be customized for the Middle East market and contains exciting and educational content relating to mathematics at work around the world and in our everyday lives. Compete in a live-action snowboard race, control a Mars rover, design and play your own video game, capture your image in a 360 freeze-motion video. Experience real math at work with a range of 40 immersive interactive exhibits across sport, nature, robotics, music, movie-making and more. 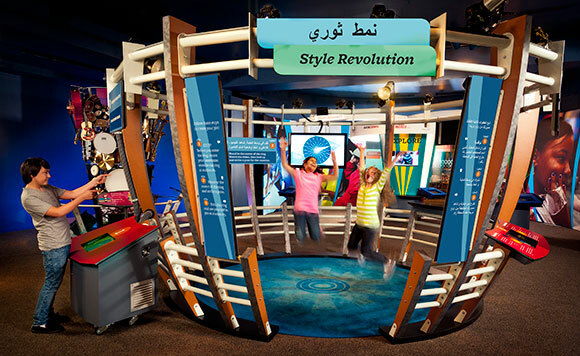 Provides interactive exhibits that allow visitors to experience math within the cultural backdrop of Arab-centric imagery, landmarks, customs, culture and language. Highlights Middle Eastern traditions and accomplishments, spotlighting a range of milestone historical links to the evolution of math. Features authorities from a range of fields in and from countries across the Middle East. Presented in dual language, with text and graphics displayed in Arabic and English. demonstrating how their work and theories are still relevant today. A selection of modern day personalities with roots in the Middle East and Muslim majority countries are profiled–some offering first-hand insights–about how they use math in their respective fields. Features a range of instruments as it explores the connection between math and music. It has been customized to include instruments played in Middle Eastern culture. Visitors design a skyscraper, as they explore buildings, bridges and other civil engineering wonders found throughout the Middle East and the wider world. The exhibition is further customizable to serve audiences with other language preferences as well and can be refined to best serve and meet the needs of all communities in the Middle East and North Africa regions. The exhibition debuted globally at Smithsonian Institution. The touring exhibition is underwritten by Raytheon.